The father of a young man who has been fighting for his life in intensive care for the past week after a freak accident has spoken of his thanks for the support his family has received. Ryan Gault, from the Nelson Drive area of Londonderry’s Waterside, fell down a flight of stairs on Wednesday morning last week while getting ready to start work. He suffered serious head injuries, and has undergone three operations at the Royal Victoria Hospital in Belfast, where he remained in an induced coma yesterday. A campaign to support the family of the well-known and popular young man, a member of Caw Flute Band in Londonderry, has sprung up. A website for people to donate to help pay for the family’s travel costs to and from Belfast has been set up, and prayers are being said across the city for Ryan’s recovery. 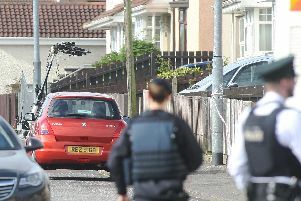 “He fell down the stairs at half four on Wednesday morning,” Allister Gault told the News Letter. Mr Gault called 999 and, after paramedics arrived, his son was taken straight to Altnagelvin Hospital. “He was scanned in Altnagelvin, and the scans were sent up to the Royal (Victoria Hospital in Belfast) to the neurology department,” Mr Gault said. Mr Gault explained that, once at the Royal Victoria Hospital, his son was given three operations over the course of the first 48 hours, including the removal of a portion of his skull due to swelling and bleeding on the brain. He has been in the intensive care unit ever since. “We can’t get over the support that people have given us,” Mr Gault added. Mr Gault also thanked the medical staff he said have been working tirelessly to keep young Ryan alive.